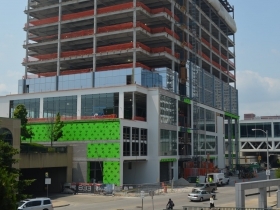 833 East is rising up. Photo by Jack Fennimore. 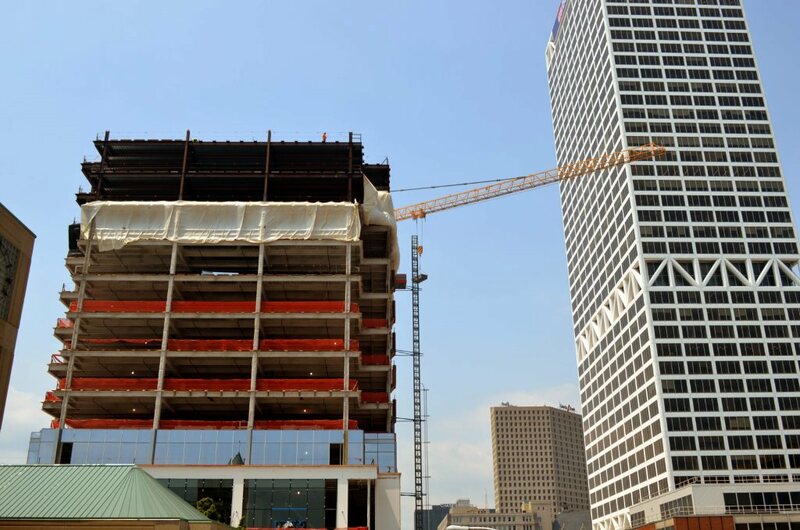 Northwestern Mutual’s new tower seems to get all the attention, but it’s that other downtown office building that is already changing the skyline. When finished, the new office tower 833 East will rise 18-stories above E. Michigan St., just south of the U.S. Bank building. 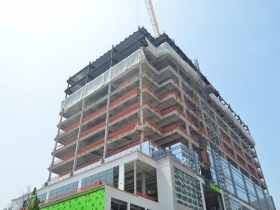 Developed by Irgens Development Partners, the new tower will include 358,017 square-feet of rentable space. 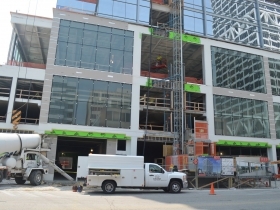 The office tower is being built by C. G. Schmidt and designed by Kahler Slater at an announced cost of $101.51 million. 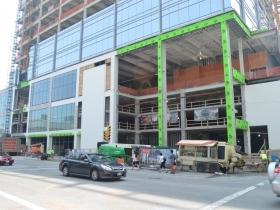 When finished it will be connected into the skywalk system that is centered around the US Bank Center. 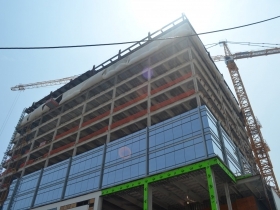 The new building’s expected occupancy date is February 15th, 2016. The tower is close to half its finished height and already visible from N. Lincoln Memorial Dr. and a number of other spots around the lakefront. It seems safe to say the partners at anchor tenant Godfrey & Kahn will have great views from their corner offices. 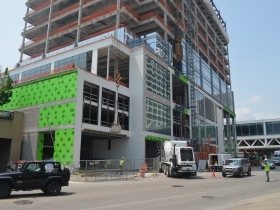 Unlike Northwestern Mutual or the new Bucks arena, 833 East will receive less than half a million dollars in public subsidy. Mark Irgens and his team found more 100 investors in the project, and got Private Bank ($24 million), Bank Mutual ($11.5 million), Associated Bank ($24 million) and Anchor Bank ($11.5 million) to provide financing. The only financial assistance from the government comes from the Wisconsin Economic Development Corporation, which is providing a $495,213 land remediation grant. Irgens was also aggressive in lining up tenants before construction even started, leasing 168,155 square-feet before construction started. Godfrey & Kahn will be joined by Cresa, Colliers International | Wisconsin, First American Title Insurance, Jason Inc. and a handful of other tenants to be announced. The city was quick to note the future increase in property taxes coming from the development. They’ve captured the increment in a new tax-incremental financing district which will be used to help finance the lakefront extension of the Milwaukee Streetcar. I haven’t received word if the city will let Mark Irgens drive the first lap. When finished the project will have created more than 400 construction jobs and consumed more than 2,300 tons of structural steel, 750 tons of reinforcing steel and 20,000 cubic yards of concrete. Irgens also voluntarily committed to 25 percent of the on-site project hours of work being done by minorities or Milwaukee County residents. In addition the firm committed to 25 percent participation of small, minority, women-owned or disadvantaged businesses. For more on the project, see our March Friday Photos article or our detailed story on the groundbreaking. Prediction: I’m going to have to once again defend this project’s architecture in the comments section. Thanks for the awesome pictorial update. Is it really only about half of its finished height though? By some counts, it should only have a few more stories to go . . .
Dudemeister: It only has 4 floors left to go, so it’s well above half its height. In your defense, I also love the architecture of this building, especially for that area. Really enhances the skyline and the glass they chose is wonderful for reflecting the surrounding buildings.